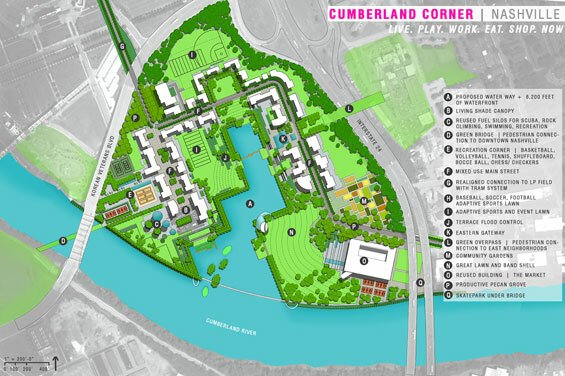 As a thriving community and precedent for brownfield redevelopment, Cumberland Corner | Nashville is envisioned as the new, hip destination centered on recreation and health. In blending a culture of fitness enthusiasm with sport, living, working, dining, healthcare, food production and a vibrant water front, the neighborhood becomes truly revolutionary. 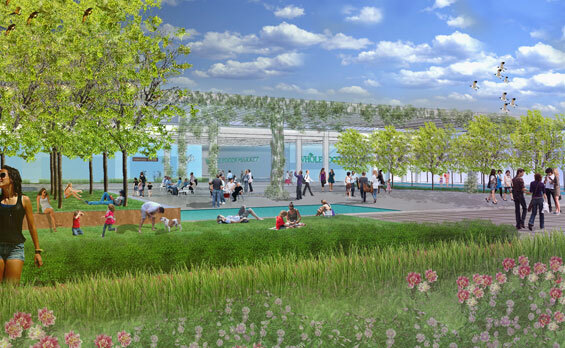 A fresh perspective on brownfield redevelopment, Cumberland Corner | Nashville is stitched together by a cohesive collection of recreational pieces and a bold gesture of an expansion of the Cumberland River into the heart of the community. This configuration guides the redevelopment, as stormwater infrastructure, buildings and structures, horticultural palette and circulation are carefully choreographed throughout the recreational spine and newly aligned waterfront. The experience of the community is lively, energized not only by the diverse array of active and passive sports, but also a series of mixed use buildings that combine residential, commercial, office space, health care and a unique adaptively reused market. FORM | The form of the neighborhood is derived from the grid of downtown Nashville, fostering a seamless connection between pedestrian and vehicular circulation to surrounding infrastructure. Key elements located off the grid serve as signature landmarks; the fuel silos remain and adopt new uses such as scuba diving, rock climbing, agricultural production and a large slide; the existing warehouse remains, but is deconstructed in part as an open air terrace with a gracious shade canopy meshing into an open floor plan that has been modified for restaurants, markets and food production. 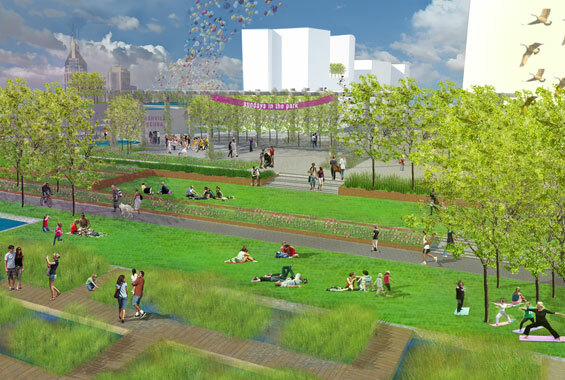 The shade canopy is also used in proposed development, at the southern end of the pedestrian-only main street, leading to large terraces of native planting and lawn for passive use, all spilling into the expanded waterfront. 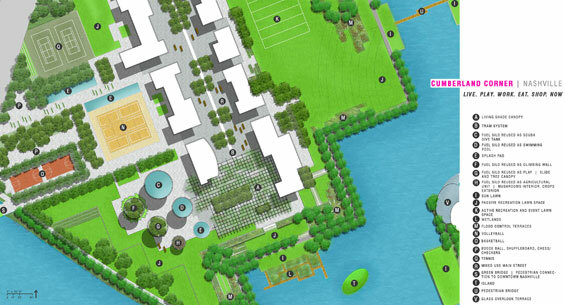 SPORTS | Interlocking sports fields and elements house beach volleyball, basketball, tennis, shuffleboard, bocce ball, rock climbing, scuba diving, skateboarding and chess/ checkers. 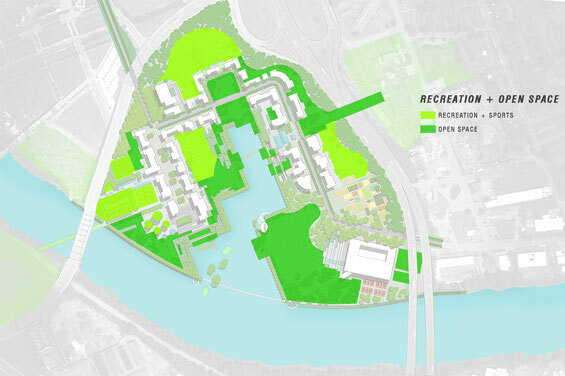 Larger expanses of green space are distributed throughout the community, offering space for organized and competitive team sports such as, baseball, football, soccer, field hockey, lacrosse and ultimate Frisbee, as well as space for pickup games. The expanded waterway allows for water sports including, rowing, canoeing, kayaking and paddle boating. 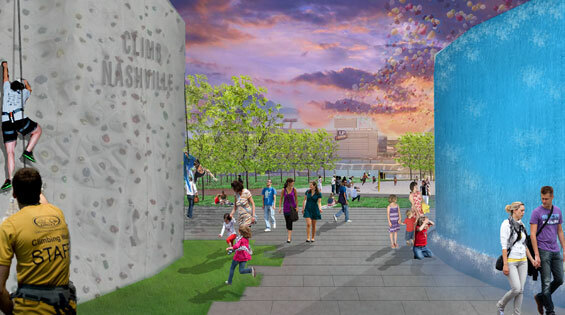 MUSIC + EVENTS | A large event lawn and bandshell with a spectacular view to downtown Nashville anchors the proposed waterfront community and creates a wonderful space for Nashville to celebrate its culture of music. Directly behind the stage is a glass overlook terrace which protrudes over the water and provides views throughout the community and downtown, particularly attractive for an evening sunset. STORMWATER + HORTICULTURE | Stormwater and floodwater is harnessed through a multitude of systems. 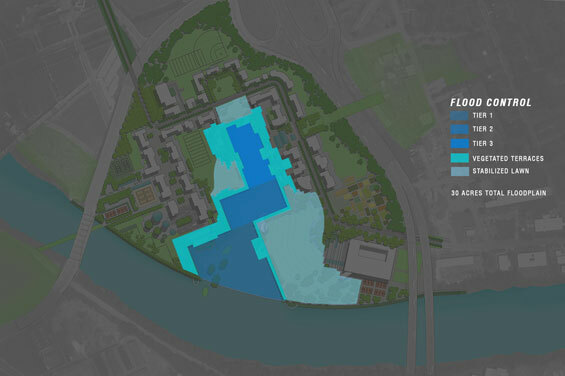 The proposed extension of the river into the site is tiered with a series of weirs in a manner to receive and manage fluctuating river water levels. Adjacent to the tiers are a series of vegetated terraces, representing the native river ecology found in Tennessee, consisting of a variety of upland and lowland species. 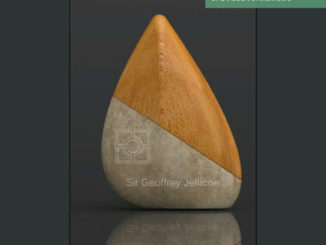 Throughout the landscape are water features that entertain and also harness and control stormwater. These features represent an effort to collect, manage and clean stormwater in primarily open systems. PRECEDENT SETTING | Cumberland Corner | Nashville merges crucial issues facing cities around the United States and globe: brownfield redevelopment and overwhelming obesity. 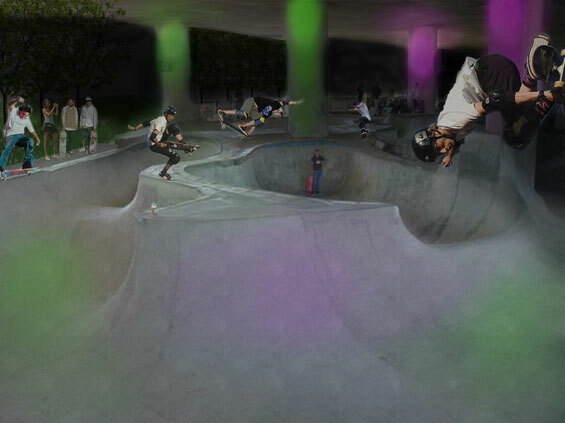 An exciting precedent can be set where recreation and sport anchor and catalyze new community development.